The vitagua in my books Indigo Springs and Blue Magic is a fluid that is deep blue in color, faintly luminescent, and it has the viscosity of fresh blood. I have always imagined that light shines on it with the same intensity that it does when it hits a fresh wound, and in fact one of the other names for this liquid magic is 'spirit blood.' There's a sense in which the earth starts bleeding vitagua in these two books: it seeps from an inner realm into the real world. I've tried to recall precisely what inspired this specific material back in the early 2000's, when I first started working on Indigo Springs. I can remember being very taken with the idea of magic flowing into the world through a crack in the ground. I had a few false starts on the book, and in at least one the characters found it in a break in the pavement in a back alley. And before that attempt was a novella (one I never published) where the world went so magically wrong that cities and towns broke free of their infrastructures. They ended up roaming around North America like buffalo, carrying their residents with them. But the specifics of why a fluid, why liquid magic--some of that is simply lost to me. It was such a strong image, but it was over a decade ago. I remember wanting a tie to a bloodlike substance, wanting red blood, blue magic, and clear water as visual images within the story. When I dig for more, I flash on a Frank Herbert introduction to Dune, wherein he wrote about wanting to write about water shortages and oil shortages and how spice arose from that. There's a sense in which both Dune and my Books of Chantment are about poor resource management, so perhaps there's a tie there, an influence. What is probably most true is that I had the image I wanted--the liquid magic, long lost, flowing back into the real world--and then I had to find a way to make it work. And that came when I wrote a story called "Nevada," about two sisters who could make raw magic into mystical objects called chantments. When I made that connection--when I realized that vitagua, which can't be handled directly, could be source of chantments--then Astrid Lethewood, her family history and her power struggle with Sahara all came into focus. That was when I was able to start writing the books that became Indigo Springs and Blue Magic. 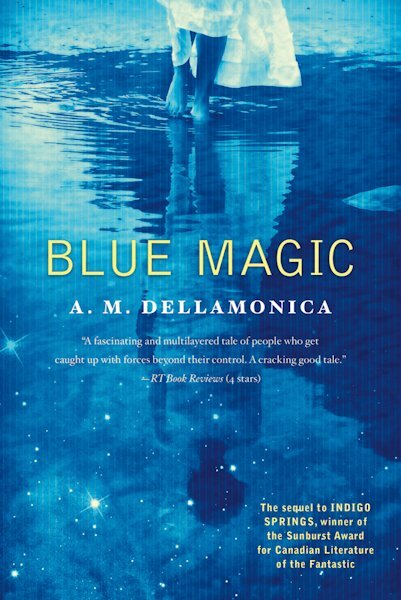 A.M. DELLAMONICA is the author of Indigo Springs, which won the Sunburst Award for Canadian Literature of the Fantastic. 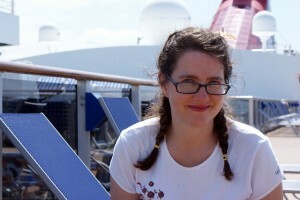 Her short fiction has appeared in Asimov’s, Realms of Fantasy, Sci-Fiction and Strange Horizons, and in numerous anthologies; her 2005 alternate-history Joan of Arc story, “A Key to the Illuminated Heretic,” was short-listed for the Sideways Award and the Nebula Award. Dellamonica lives in Vancouver, British Columbia. 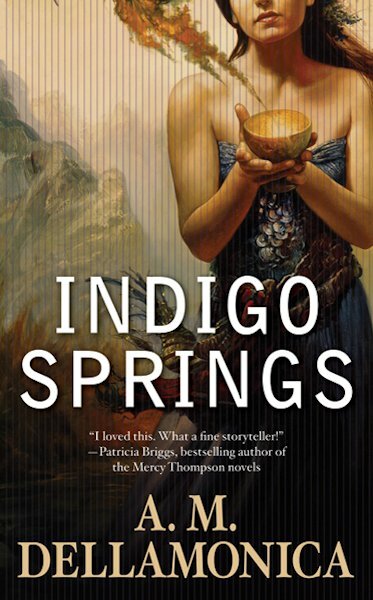 What: One commenter will win a Trade Paperback copy of Indigo Springs from The Qwillery. What kind of magic would you like to have? I would like to be able to teleport (so magic wise: controlling time and space) so I could see the world. I was intrigued about this series after reading The Big Idea on John Scalzi's Whatever blog, and now with this, I guess it's firmly on my TBR List! The kind of magic I would like: Dumbledore. Everything he can do. I' d want an invisiblity cloak, like Harry Potter. The magic I'd like to have is the ability to read minds and influence people's thoughts. I think I could have some fun with that. Indigo Springs sounds fascinating and I can't wait to read both novels. Thanks for the chance to win the first Q.
I would like Pixie Dust to create magic wherever I sprinkled it. First thing I'd do is use it to fly! I agree w/ Rissatoo... to have magic like Samantha or Dumbledore would be awesome! W/ a nose twitch or wand flick and be to accomplish just about anything. But if we have to narrow it down, I think I'd like the magic to be able to heal. I'd love to have the power to manipulate time. I'd like to have the power of being able to control the elements. I would like the ability to heal, teleport, and invisibility. I would love to be able to teleport... no more worries over time and gas. Oh that's easy, although it's cribbing a bit from Zelazny, but it ties into a mutual interest Alyx and I have--photography. I would love to have the magical ability to transport myself through a photo that I have made. Somewhat more limited than teleporting, since I would have to have been there before with a camera. I think Magic *should* have limits.